Torino As we move forward on the Home Savers Campaign we are finding victims of predatory practices among all communities black, white, and brown, but more often than not since these are lower income communities, there seems to be a significant tilt towards residential segregation. Lawsuits in some cities and research reports are starting to argue that this is blatant discrimination. 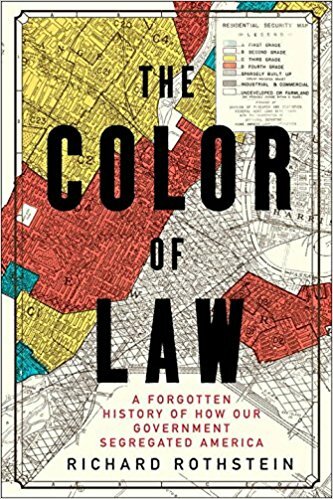 The Color of Law demonstrates that racially explicit government policies to segregate our metropolitan areas are not vestiges, were neither subtle nor intangible, and were sufficiently controlling to construct the de jure segregation that is now with us in neighborhoods and hence in schools. The core argument of this book is that African Americans were unconstitutionally denied the means and the right to integration in middle-class neighborhoods, and because this denial was state-sponsored, the nation is obligated to remedy it. Rothstein demonstrates how de jure segregation worked most effectively in general housing and housing finance policy, but also in the areas of school location by local communities and tax assessment policies that over assessed lower income areas and under-assessed largely while middle income areas. The situation around redlining and the failure of the Federal Housing Authority to guarantee mortgages in non-white areas until the mid-1970s is well known, but Rothstein moves the clock back as well, citing a 1910 Baltimore “ordinance prohibiting African-Americans from buying homes on blocks where whites were a majority and vice versa.” He notes that similar zoning restrictions were passed in Atlanta, Birmingham, Miami, Charleston, Dallas, Louisville, New Orleans, Oklahoma City, St. Louis, and Richmond among other cities. De jure segregation was not just a Southern and border state phenomena. Taking the segregation and siting of public housing projects as an example, he notes that a dozen states passed laws in the 1950s requiring a popular vote before approval of a location. That dirty dozen included California, Iowa, Wisconsin, and Minnesota, hardly Southern strongholds. He tells the story of the committed segregationist city fathers of Boston, Massachusetts who built the Mission Hill housing project, where I hit the doors as a young organizer, and then built a Mission Hill Extension, so that the first was black, and the second was white. The fight to keep Detroit a haven for white homeowners propelled neighborhood segregationist into the mayor’s office there. Rothstein also effectively argues that suburbanization was a governmental supported and enabled segregation project. And, of course he revives the argument that rent-to-own and installment land purchases in urban areas, forced by the inability to acquire home ownership by minorities in any other way, created ghettos and exploited African-Americans. As we know from hitting the doors in Philadelphia, Pittsburgh, Youngstown, Detroit, Akron, and so many other cities with ACORN’s Home Savers Campaign, that’s still the case. Finishing the book or walking the streets of urban America, there’s never a doubt that governmental fiat blocked natural integration and mandated segregation. When will justice be served and a remedy be offered?